While the title of this article may surprise you, we’ll show you how a family hammock stacks up to a sofa as a family gathering place. You may think, at first, there is little connection between a hammock versus a sofa. However, family hammocks allow the whole family, kids and all, to have more fun together than any sofa ever made. In fact, handcrafted family hammocks come in different sizes, like those from Hammock Heaven, depending on the size of your family. From XL to XXL to Supernova family hammocks can deliver fun for your whole family, whether you have one or two kids, up to six or more. Family hammocks are much more fun for adults and kids than sofas, even when they’re big enough to hold your entire family. These extra-large hammocks are also wider than large so-called “double hammocks,” comfortable for you and your life partner. Many family hammocks hold up to 600 to 800 pounds of humans. They’re made with thicker cords and feature other reinforcements to hold the extra weight of the whole family. Often, those who prefer hammocks to traditional flat beds, use double or family hammocks to better enjoy their overnight deep sleep. They find the extra length and width of family hammocks comforting for all night sleeping. Whether installed indoors or out in the yard, family hammocks offer more fun and relaxation than sofas, however large or expensive. Your kids particularly will enjoy the gentle swaying of the hammock, while playing and relaxing with their parents. While a sofa makes a design statement about your décor, most are not made with “sleep” in mind. If you want to take a nap, you’ll have to try different positions until you’re at least semi-comfortable. The best feature of sofas is their mobility, meaning you can rearrange your furniture, including your sofa, with relative ease – easier than relocating your indoor hammock. However, the anchors for your hammock are unobtrusive and can easily be hidden creatively. Outdoor sofa considerations include being sure the covering is designed to face inclement weather. Indoor sofas can quickly become ruined when used outside in the yard or on the deck/patio. Some materials have a problem drying, even if the hot sun appears after a rainstorm. Drying cushions on a sofa often is a particularly troubling problem. While a quality family hammock is not for everyone, your family, including the kids, will love it more than a sofa. Sure, if laying on your couch is your favorite spot at home, you may not want to change it. However, when you’re laying on it, a sofa cannot accommodate multiple people. Locating your family hammock outdoors will offer more fun than a deck or patio sofa. If you are already a hammock aficionado, you know this to be true. For design reasons, you may still want to place an outdoor sofa on the entertaining area of your yard. Using both a sofa and a family hammock delivers a good solution to this dilemma. When you’re entertaining guests, you might use your outdoor sofa to handle multiple guests. 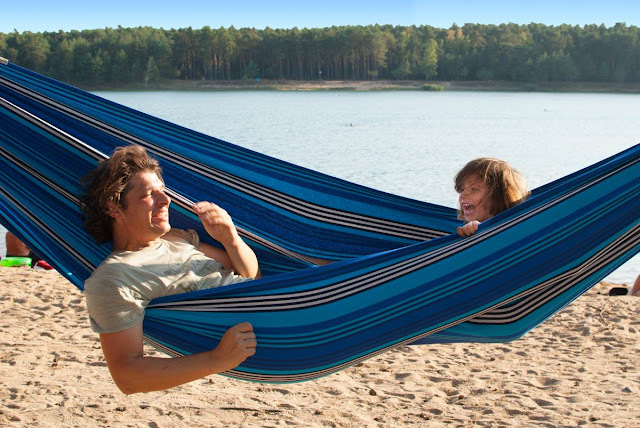 If you’re just getting your family together, you will want to use your family hammock to surround yourself with your partner and your children.